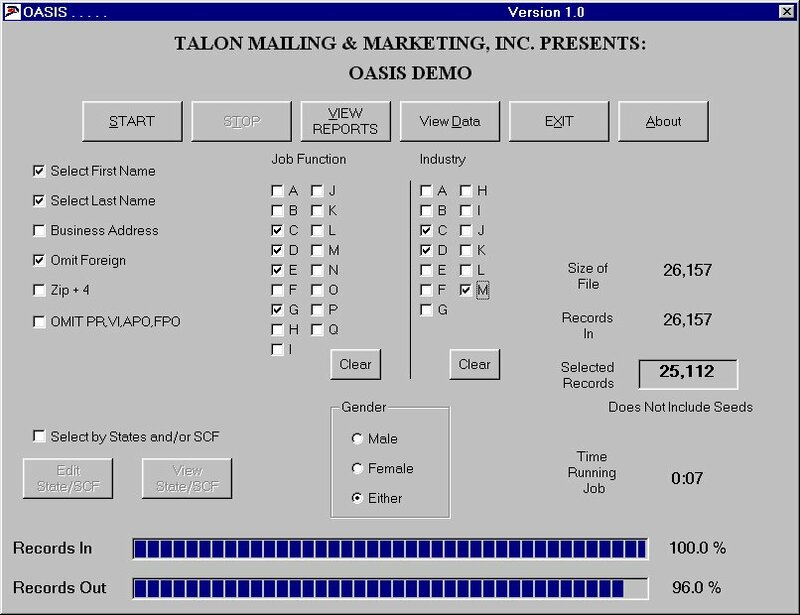 Welcome to the Talon Mailing & Marketing June 2011 Newsletter. For more than a decade, computer software makers and security experts have tried to stop spam, and failed — it's now 90 percent of all email traffic. But some University of California researchers may have found the magic bullet: Simply cut off the money. It turns out that while spammers use thousands of domain names and hundreds of shell companies to peddle Viagra, knockoff handbags and pirated software, almost all sales of those goods are handled by just three banks in Azerbaijan, Latvia and the Caribbean nation of St. Kitts and Nevis. Furthermore, almost every single sale made by spammers is processed by credit card clearinghouses such as MasterCard or Visa. The researchers argue that the major credit card companies could stop spam dead in its tracks by refusing to process payments. But will they? "The main problem is that spam isn't necessarily illegal," said Mikko Hypponen of the Helsinki, Finland security company F-Secure, in an interview on May 19 with BBC Radio. "This depends on which country you are [in], how it's being sent and all that." "And we have to remember that spam is actually very profitable for the credit card companies themselves," added Hypponen, who was not involved with the University of California study. "That might affect how likely they are to actually do something about this." A team of 15 researchers based at the University of California, San Diego, and the University of California, Berkeley, used prepaid Visa cards to buy thousands of dollars' worth of goods advertised online by spammers. "Spam-based advertising is a business," they argue in their paper. "While it has engendered both widespread antipathy and a multi-billion-dollar anti-spam industry, it continues to exist because it fuels a profitable enterprise." They traced the payments through a complicated web of affiliate programs and back-end processors, only to find dramatic consolidation at the deepest levels. Only a dozen or so organizations were running the online stores selling the goods, and only 13 banks were handling the money. In fact, 95 percent of the transactions were handled by just three banks: Azerigazbank in Azerbaijan, St. Kitts-Nevis-Anguilla National Bank in St. Kitts and Nevis (which has been linked to online scams) and the Latvian branch of DnB NORD, a Danish subsidiary of a Norwegian bank. The researchers suggested that these banks could be pressured into refusing to process transactions from spammers, but doubted whether it would work. The online stores could find new banks, and "it is not even clear that the sale of such goods is illegal in the countries in which such banks are located." Far more effective would be pressuring the major credit card associations to halt processing of spam-related sales, which could be easily identified and put on a "financial blacklist." "We can provide credit card companies with lists of known spammers or known spam back ends -- those are the systems they actually use to move the money around," Hypponen told the BBC. "With that information, credit card companies, like Visa, MasterCard, American Express, they can simply shut down the operations and stop money flowing from their cards to those merchants." The University of California researchers note that although telling credit card companies how to run their businesses might present "political challenges," there is already a precedent. Five years ago, the U.S. Congress forced the credit card associations to stop processing payments from U.S. residents to online gambling companies, effectively shutting down the industry in this country. 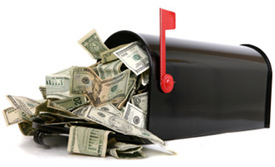 Here are some ideas about how to make direct mail a more effective, more engaging marketing tool for your business. Rent names from a list house where geography, type of industry, and other factors can be filtered. Rent a list from a trade publication that is audited – that way you know the list is qualified. Rent a list from a trade show/event; . this list of people is clearly engaged in the industry. 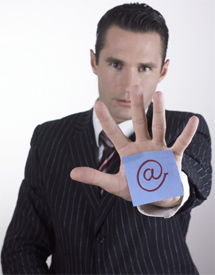 Send an email to your database saying, “Hey, can I send you…xyz?” Use email to opt in your audience. 4. Let your audience interact: The people you are sending mail to are hopefully overlapping with the people who are liking your Facebook page and following your Tweets. They’ve established that they have insights about your company, your products, and/or your services. 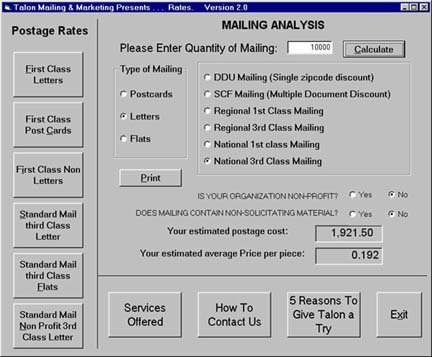 Why muzzle them with your direct mail piece? Ask them to respond by posting a video to your Facebook page, or include a survey that could be returned as an entry into a contest. Include a link or QR code that takes the recipient to a relevant video. Converse. 5. Think outside the box: This is so important, just as it is with your website, with your advertising, and with all of your marketing. Postcards can serve a purpose, but there is so much more that can be done now with direct mail campaigns. From DVD mailers to things I’ve never seen and can barely imagine, this marketing channel is ready and waiting for a slam-dunk, thoughtful, engaging campaign. Are you ready to send one out there? The U.S. Postal Service wants Americans to know that even the temptation of French toast sticks and a Double Crossain'wich wouldn't stop its letter carriers from delivering the mail on time. After unleashing its lawyers, the U.S. Postal Service has struck a settlement with Burger King over an ad campaign launched last year that featured a letter carrier getting distracted from his job by delicious Burger King breakfast food. Apparently, the Postal Service did not appreciate the portrayal. In the ad, a letter carrier in a uniform resembling that of a Postal Service employee sang about the joys of Burger King's new breakfast menu. The offending verse was: "With pancakes and eggs on my plate, the mail has to wait." According to a Postal Service statement issued Friday, the agency asked the fast food giant to stop airing the ad, arguing that Burger King used its logo and uniform without permission while portraying a letter carrier in a "less than favorable light." Though Burger King denied wrongdoing, they reached a settlement allowing the company to use a uniform similar to the official Postal Service garb, minus the logo. 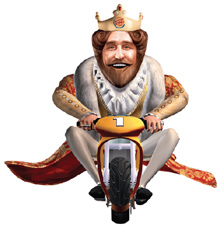 Burger King is expected to air a "revised" and "more positive" commercial -- one that presumably leaves viewers feeling better about the work ethic of their letter carriers. Burger King also said in a statement that the company would "revise the logo on the mail carrier uniform" under the new agreement. The company said it stopped airing the original ad in March and does not plan to air it again. Sunday, June 12, 2011. Yankees vs. Cleveland Indians, 1:05 PM. iMeet.com - Your own meeting room online. Talk through your computer from anywhere in the world. Or connect to any phone or mobile device at no extra charge. Invite guests – up to 15 at a time. It's free for them. No downloads or headaches. Phone number: 800-224-2242 - A most unusual link. Call this number from your cell phone. This free service, called ChaCha, will allow you to verbally state your question and within a few minutes you will get an answer to your question via text message! The Email Game - Meet the Email Game — a new way to read and respond to email. Claims to be 30% faster, 100% more fun. Neerlife.com - Set task reminders on your cell phone based on your location. 43Things.com - Join over 3 million people who list their goals, share their progress, and cheer each other on.